How about some boozy fun for your Tuesday? I've been on a milkshake kick lately, as we have lots of last summer's frozen fruit in our freezer, and ice cream for dinner is one of those amazing grown-up luxuries I like to indulge in from time to time. This week in Seven Days, I wrote about cocktails — specifically, about "modifier" or "secondary" spirits including liqueurs, brandies and fortified wines. These alcoholic mixers layer additional aromatics and flavors into a drink — herb notes, fruity notes, sweetness, bittering, sours — and open up new sensory dimensions with minimal effort. 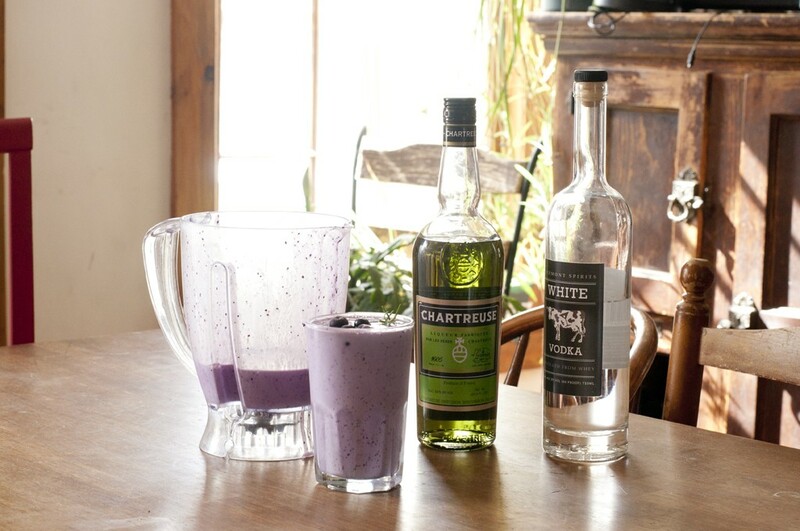 So, here's a spirited locavore milkshake, made with ice cream from Strafford Organic Creamery; vodka from Vermont Spirits Distilling Co.; blueberries from Super Acres in Orford, N.H., and Chartreuse, one of the mixers I featured in my cocktail piece. It's almost savory on the nose, with notes of lovage or celery, sweet on the tongue and loaded with herbal goodness. And it's lovely with blueberries and cream. Place all ingredients in a blender and blend until smooth. Spritz the inside of a tall glass with bitters. Add milkshake; garnish with fresh herbs and frozen blueberries.